A lot of borrowers fail to realize how important the lender, and particularly the loan officer, are in making a purchase or refinance a successful transaction. Simply all one must do is go online and look up recent surveys for some of the major lenders in the country and you can get a quick sense as to how terrible some lenders (and the loan officers that work from them) really are. From low-balling fees, to not knowing program guidelines and therefore pre-qualifying people that shouldn’t be shopping for homes, to terrible follow-through and communication, it’s HARD to find a great mortgage lender. In our business, we often say there is a reason people go to LendingTree or search online for a mortgage company: it’s because they’ve never had a great loan officer that took care of them. The challenge for self employed borrowers is that your loans are more complicated than any other out there. 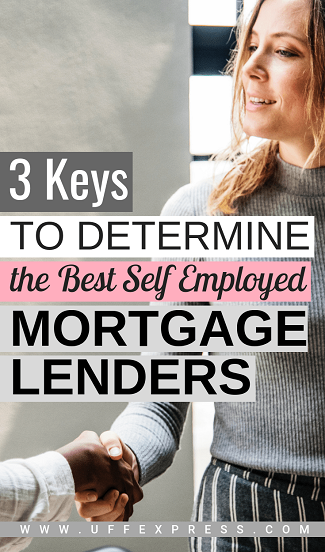 A self employed mortgage is not easy to qualify for, the rules and guidelines are extensive and there are a ton of nuances, so choosing the best lender is more important for you than anybody else. Below, we’ve highlighted the ABSOLUTE musts in order to find the best mortgage lender. It’s not the lender that matters, it’s the loan officer. The lender’s name or brand recognition isn’t going to do anything for you other than cost you more money (to help cover their marketing budget). You deal and work directly with the loan officer. They take your application and are responsible for asking you the right questions. They’re the ones responsible for knowing the rules and making sure you meet them initially. They’re the one that calculates the initial income to determine if you qualify. They’re the one that you communicate with from start to finish and rely on with the most important financial transaction (other than starting your business) in your life. The loan officer alone will be the reason things go smoothly or your loan gets declined. The best mortgage lenders and loan officers know what to look for. They know what documents to gather upfront, they know what questions to ask and they know the calculations required for self employed borrowers. How Can You Interview to Find the Best Loan Officer? Easy. Ask them questions and do your research. Step 1: Ask them specifically how long they’ve been in the business and originating mortgages. If they work for an internet lender and have been in the business less than 1-1.5 years, then run away. If they work for a local lender and have been in the business less than 2-3 years, then run away. The mortgage industry is complicated, and the guidelines are extensive. It takes loan officers hundreds of loans before they grasp everything well. Generally, it takes 60-75 loans under belt to really get a good feel for the basics, let alone handling the complexities of self employed mortgages. The best lenders are the seasoned ones. They’ve learned lessons (likely the hard way by making a mistake on a prior loan) and still survived in the business, and likely have already seen your scenario before. Step 2: Fact check their answer. The government thankfully has a system where anybody in the country can do research on a mortgage loan officer. You can find out (1) if the loan officer is licensed (more on that later), (2) see when they started at their current lender and (3) see their prior job and mortgage lending history. Type in your loan officer’s name (First and Last name is fine) or their NMLS ID. If you get the NMLS ID it’s easier to find. Once you’ve found the proper person and are in their profile look for their Office Location. On the far right you’ll see how long they’ve worked for that company. Under the Employment section you can click on the “View Self Reported Job History” to see if their prior employers were mortgage lenders. Under Federal Registration it will either be blank or have some information. If they are ‘active’ or authorized to conduct business, that means they likely didn’t have to pass any federal licensing to become a mortgage loan officer. Federally Chartered Banks can have loan officers operate under their umbrella and therefore those loan officers never have to take any formal testing to sell mortgages. If you see a long list of state licenses for the loan officer, that means they not only had to get nationally licensed by taking an exam, but also had to get licensed in each state as well. If you go into something blindly, then it’s difficult to know what to keep an eye out for. And if you’re not sure what to look for then it’s going to be impossible for you to find the best lender. And given the magnitude of buying or refinancing a home, it’s wise to at least know a little about what’s going on. Start with the basics: have an idea of what it takes to qualify for a self employed mortgage. The loan officer needs this to calculate your income and without it, they have no clue whether you qualify. The best loan officers will also ask you during the application if you’re self-employed. If your loan officer didn’t ask you that or if they didn’t ask you for income documentation, then you need to find another lender. The best loan officers will also know to ask all self employed borrowers where the funds for the down payment and closing costs will come from. There are rules about using business funds for such costs, so great loan officers will be keeping an eye out for that and make sure they’re vetting those things upfront (instead of things blowing up on them once you’re under contract). In the mortgage business it’s no secret that every borrower wants the best deal, but if that were true nobody would do business with the largest and most nationally recognized (and marketed) brands in the business. However, years after you close on your home, you’re not going to remember that you saved $400 in fees by shopping lenders. Instead, you’re going to remember if you had a nightmare scenario that you’ll tell all of your friends about, or if you had the best and most smooth transaction you could have imagined. If your lender doesn’t do all four of those things, then you don’t have the best mortgage lender for self employed borrowers. Frankly, you probably don’t have the best lender for any borrower, but certainly not for somebody that’s self employed. We often don’t promote ourselves in our articles, but this is an exception. At UFF, we have some of the best loan officers in the business. Some of our branch managers and loan officers have led and coached large teams. Most of us have worked for one of the largest internet lenders in the nation and gained tons of experience due to the volume of loans we originated. On average our loan officers have been in the business for 7 years and have closed more than 500 loans. Our experience is unmatched, we know what we’re doing, and we are by far one of the best mortgage lenders for self employed borrowers in the nation. We would love the opportunity to serve you and make you a ‘client for life’. Visit our homepage and read through the testimonials at the bottom to get a feel for what our clients say about us. Once you’re ready to find out if you qualify, give one of our licensed loan officers a call or apply online. If you’re in the beginning stages of your search, browse some more of our educational resources to learn all you need!